The Porsche 911 made by Porsche AG of Stuttgart, Germany was built from 1964 to 1989. The Porsche 911 is one of the most successful racing cars in the history of motor-sport. While Porsche changes the internal project number for its cars, all 911 models have always been sold as the Porsche 911. The internal model number 911 was produced from 1964 to 1989. Here is a timeline of the internal model numbers referenced by Porsche and many Porsche enthusiasts. The Porsche 911 was developed as a replacement for the then aging Porsche 356, which was produced from 1948 to 1965. 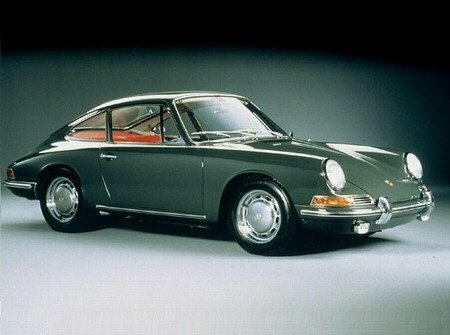 The new Porsche 911 made its public debut at the Frankfurt Motor Show in 1963. It originally was designated as the Porsche 901 however, french auto maker Peugeot claimed it had exclusive rights to car names with three numbers structured with a zero in the middle. Instead of marketing the new Porsche model with another name in France only, Porsche changed the name to 911 for all countries. The initial 911s had a 128 HP boxer configured flat-six engine. These engines displaced 1991cc and were rear mounted and air cooled. The engine was attached to a four or five-speed manual transmission. The original Porsche 911 had four seats and the car is usually called a 2+2 instead of a four-seater. Porsche introduced a more powerful 911S in 1966 with an increased engine power of 158 HP and Fuchs alloy wheels were included in the upgrade. In 1967 the company introduced the Porsche 911 Targa. The Targa name came from the Targa Florio road race in Sicily, Italy in which Porsche had great success. The 911 Targa was designed with a removable roof panel and a removable rear window made of plastic. The 911 Targa was also offered with a glass rear window from 1968 on. In 1968, the Porsche 911T was introduced to replace the 912 and the standard 128 HP model was rebranded the 911L. A light-weight racing version of the car was also produced under the 911R, but only 20 of these were produced. The 911B was introduced in 1969. The 911S received fuel injection and the 911E was delivered as the new standard model. Despite the lower power output of 153 HP for the 911E versus the 178 HP of the 911S, the 911E accelerated faster from 0 to 100 mph. From 1972–1973 the models were the same, but with a new, larger 2341cc engine. The 911E and 911S used mechanical fuel injection in all markets. The 911T was carbureted in 1972 except in the U.S. and parts of Asia where emission regulations required Porsche to equip the 911T with mechanical fuel injection. In January, 1973, US 911Ts were switched to the new K-Jetronic injection system from Bosch. The 911S model gained a small spoiler under the front bumper to improve high-speed stability. The 911ST was produced in limited numbers for racing from 1970 to 1971 with either a 2466cc or 2492cc engine that produced 266HP. In 1974, the Porsche 911 saw several significant changes. The engine size was increased to 2687cc giving the 911 increased torque. Impact bumpers were added to conform with U.S. low speed protection requirements. The use of K-Jetronic Bosch fuel injection in the 911 and 911S. Porsche introduced the first production turbocharged 911 in 1974. Labeled the Porsche 911 Turbo in Europe, it was branded as Porsche 930 in North America. Starting out with a 3.0L engine producing 258 HP, the early cars are known for their excellent acceleration along with challenging handling characteristics and noticeable turbo lag. The body shape is distinctive thanks to wide wheel arches to accommodate wider tires, and a large rear spoiler often known as a “whale tail”. In 1978, engine output increased to 298 HP, and an intercooler was added. Porsche introduced the new version of the 911, called the “911SC” in 1978. It included a 3.0 liter engine with Bosch K-Jetronic fuel injection and a 5 speed transmission. A Cabriolet concept car was introduced at the Frankfurt Motor Show in 1981. The car a true convertible and featured four-wheel drive, but that was not included in the production version of the 911SC. The 911 Cabriolet launched in 1982, as a 1983 model and was Porsche’s first cabriolet since the 356. For the 1984 model year, Porsche introduced the 911 3.2 Carrera to replace the 911SC. The 911 Carrera was the last year of the 911 series. This version of the 911 accelerated 0–60 mph in 5.4 seconds and had a top speed of 150 mph. In 1984, Porsche also introduced the M491 optioned 911 which was commonly known as the “Turbo-look”. It was a style that resembled the Porsche 930 Turbo with wide wheel arches and the distinctive “tea tray” tail. It featured the stiffer turbo suspension and the improved turbo braking system as well as the wider turbo wheels. Sales of the 911 Carrera “turbo look” were particularly strong for its first two years in the United States because the Porsche 930 was not available.